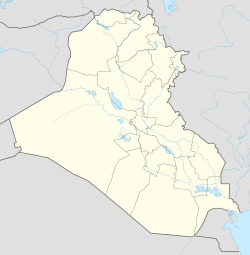 Al-Hirah (Arabic: الحيرة‎ al-Ḥīrah, Syriac: ܚܝܪܬܐ‎ Ḥīrtā) was an ancient city in Mesopotamia located south of what is now Kufa in south-central Iraq. Al-Hirah was a significant city in pre-Islamic Arab history. Al-Hirah (4th-7th centuries) served as the capital of the Lakhmids, an Arab vassal kingdom of the Sasanian Empire, whom it helped in containing the nomadic Arabs to the south. The Lakhmid rulers of al-Hirah were recognized by Shapur II (337-358), the tenth Sasanian emperor. Ḥīrā was a Christian centre, being a diocese of the Church of the East between the fourth and eleventh centuries. A particular Mār 'Abdīšo' (Syriac: ܡܪܝ ܥܒܕܝܫܘܥ‎) was born in Maysan (Syriac: ܡܝܫܢ‎ Mayšān) and moved to Ḥīrā after studying elsewhere under Mār 'Abdā. There he gained widespread respect as he built a monastery and lived a pious life. The Sasanian emperor Bahram V won the throne with support of al-Mundhir I ibn al-Nu'man, king of Ḥīrā, in 420. He was amazed and showed great respect as he encountered the saint near the village of Bēṯ 'Arbī on his way back from the imperial capital Seleucia-Ctesiphon (Syriac: ܣܠܝܩ ܩܬܝܣܦܘܢ‎ Salīq-Qṭēspōn). From c. 527, al-Hirah was opposed by the Ghassanids, a Byzantine-sponsored Arab state in Syria and Palestine. The two powers engaged in a long conflict of their own that functioned as a proxy war for the Byzantine and Sasanian Empires. In 531, the Sasanians defeated the Byzantine general Belisarius at the Battle of Callinicum south of Edessa (now in southeastern Turkey), with the help of al-Hirah. In 602, Khosrow II deposed al-Nu'man III ibn al-Mundhir and annexed al-Hirah. The Muslim conquest of Persia occurred in the 7th century. Following the Battle of Hira, the city was captured by army of the Rashidun Caliphate under the command of Khalid ibn al-Walid in May 633. Wikimedia Commons has media related to Al-Hirah. ^ Anthony Alcock (2014). The Chronicle of Seert. Bosworth, C. Edmund (2003). "ḤIRA". Encyclopaedia Iranica, Vol. XII, Fasc. 3. pp. 322–323.